A paperback version of the book Metagovernance for Sustainability can now be directly ordered by sending an email to the author, for EUR 30,00 plus shipping costs. Please send requests to louismeuleman@ps4sd.eu. 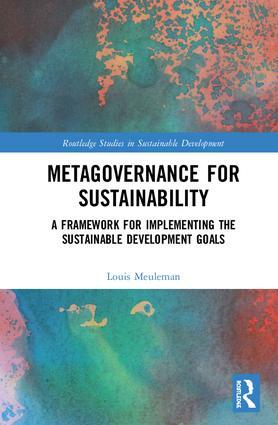 Metagovernance for Sustainability – A Framework for implementing the SDGs is available now at Routledge. A preview (Chapter 1) can be downloaded here. The 17 Sustainable Development Goals (SDGs) which were adopted by the United Nations in September 2015 are universally applicable in all 193 UN Member States and connect the big challenges of our time, such as hunger and poverty, climate change, health in an urbanised environment, and sustainable energy, mobility, economic development and environmental degradation. Sustainability has the characteristics of a ‘wicked problem’, for which there are no one-size-fits-all solutions. This book tests the hypothesis that the implementation of sustainable development, and in particular the 2015 SDGs, requires tailor-made metagovernance or ‘governance of governance’. This is necessary to develop effective governance and high quality and inclusive public administration and to foster policy and institutional coherence to support implementing the SDGs. Based on the growing literature on governance and metagovernance, and taking into account the specificities of societal factors such as different values and traditions in different countries, the book presents a framework for the design and management of SDG implementation. It shows how hierarchical, network and market governance styles can be combined and how governance failure can be prevented or dealt with. The book presents an overview of fifty ‘shades of governance’ which differ for each governance style, and a sketch of a concrete method to apply sustainability metagovernance. Metagovernance for Sustainability is relevant to academic and practitioner fields across many disciplines and problem areas. It will be of particular interest to scholars, students and policy-makers studying Sustainable Development, Governance and Metagovernance, Public Management and Capacity Building.